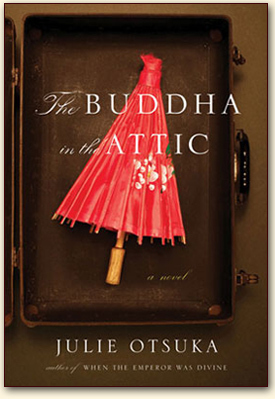 Summary (from the inside flap of the book): In eight incantatory sections, The Buddha in the Attic traces the picture brides' extraordinary lives, from their arduous journey by boat, where they exchange photographs of their husbands, imagining uncertain futures in an unknown land; to their arrival in SAn Francisco and their tremulous first nights as new wives; to their backbreaking work picking fruit in the fields and scrubbing the floors of white women; to their struggles to master a new language and a new culture; to their experiences in childbirth, and then as mothers, raising children who will ultimately reject their heritage and their history; to the deracinating arrival of war. Review: For a little book this one really packs a punch. First, I love the cover. There is something about the color combinations and the umbrella that just lured me in. Second, Aths from Reading on a Rainy Day said how much she enjoyed this book so I had to try it out. "We gave birth in towns where no doctor would see us, and we washed out the afterbirth ourselves.... We gave birth in towns with only one doctor, whose prices we could not afford.... We gave birth with the assistance of aDr. Ringwalt, who refused to let us pay him his fee.... We gave birth among our own.... We gave birth on a bumpy country road in Castroville in the back of our husband's Dodge truck...."
At first it felt as if I were reading a list, but I got used to the gentle rhythm of Otsuka's writing. In the end I loved knowing many versions of the women's experience rather than just one woman's. To hear the similarities and differences of lots of women makes me feel as if I really have an understanding of what it must have been like. Otsuka manages to share not only events, but emotions, fears, accomplishments, and the drudgery of the picture brides' lives.